The HandyDART Riders’ Alliance has filed a class-action complaint with the B.C. Human Rights Tribunal alleging discrimination in the form of inadequate HandyDART service. The complaint alleges inferior transit service is provided to people with physical and mental disabilities compared to people who can use conventional public transit. The complaint states that “People are being denied access to transit because they are unable to use conventional transit without assistance. Dignity & self-esteem are damaged. Safety is put at risk. People are being isolated from family, friends and community.” The complaint also reports that TransLink CEO Kevin Desmond stated that bringing HandyDART in-house to improve service quality would cost too much. The complaint was filed against Premier Clark, former TransLink Minister Peter Fassbender, Minister of Transportation Todd Stone, along with TransLink and the US-based corporation TransLink contracts to run HandyDART. On the pamphlet it reads door to door. I don’t get this service. I have to pick pick at another address at the bottom of the street. I’m a handy dart customer and I would equal service provide for myself. Hello HRA, Happy New Year. Patients at the Renal Dialysis, users of HandyDart Service more than ever are experiencing great difficulties with their rides to and from VGH Renal Dialysis. Kindly extend your helping hand in bringing the matter to the right authority. HRA In the news: HandyDART service awful, group says | HandyDART Riders' Alliance on HRA News – Write or phone your mayor & MLA today! New HandyDART report! 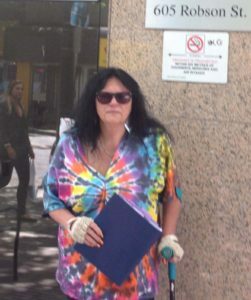 Heather Laing on HRA News – Write or phone your mayor & MLA today! New HandyDART report! Ken Biron on HRA News – Write or phone your mayor & MLA today! New HandyDART report!